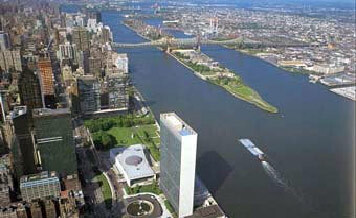 A Concrete “Press-On Nail” for Roosevelt Island? One of the most beautiful contrasts in New York Harbor is that of the verdant tip of Roosevelt Island against the sheen of Manhattan’s glass towers. That is in danger of being replaced with what might be described as a $40 million, concrete press-on nail for the island. 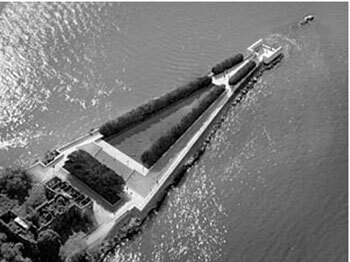 The sterile, largely paved and walled Franklin D. Roosevelt Memorial and Four Freedoms Park designed by Louis I. Kahn would run counter to our city’s progress toward reconciliation with the estuary, restoration of both marine and uplands habitats, and recreational enjoyment of the harbor. One look at the model in the image at top reveals the travesty awaiting the island, one that ends in what is literally a high-walled room. 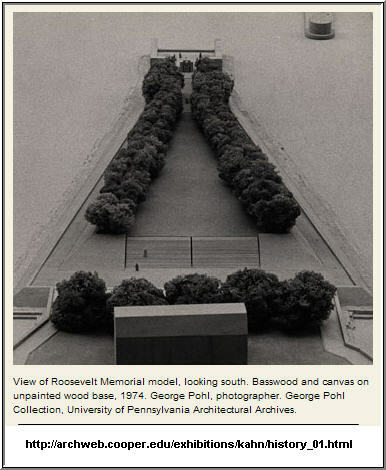 The future FDR Memorial, as designed by Louis I. Kahn, as it will look in a new Southpoint Park (rendering from the Franklin and Eleanor Roosevelt Institute). It’s a shame when quite easily the form of the memorial can be reinterpreted through natural forms and materials. The southern point of the island, in the U.S. Fish and Wildlife Service photo below, doesn’t need much improvement. Imagine that key elements of the Kahn design were expressed through natural forms and materials. Native NYC bedrock quarried from construction and tunneling to pave necessary walkways and be incorporated into the monument itself. This would better respect the environment and ground visitors in ubiety. Bedrock would also symbolize the role that the Roosevelt family has played in our city’s culture and civics. Excerpts of the “Four Freedoms” speech could be engraved into inclined slabs that allow viewers to read the immortal quotations while exhilarated by the wide open freedom of the openness around them. It would be sadly ironic to have the Four Freedoms speech carved into confining walls, especially in our overly-imprisoned era. The V-shaped colonnade of trees should be indigenous. This stand could edge the existing landfill hillock, which should be made rich in indigenous meadow wildflowers and grasses. According to the Audubon Society, wild meadow is vanishing without the attention given wetlands. A soft edge, guarded by thoughtfully placed riprap rock would allow harbor birds, tidal pool creatures, and saltwater plants to live. It would also offer safe landings to paddlers in distress. Regardless of the final form of the park, stopping the outdated version of this monument is a goal that people throughout the harbor community should share with the residents of Roosevelt Island, who have expressed their overwhelming preference for a natural restoration for the southern end of the island in repeated polls and a design exercise by the Trust for Public Land. We missed that goal by a decade in NYC, but our increasingly cleaner harbor and resurging ecosystems will afford adventure and beautiful experiences to people for decades to come. Yes, honor Kahn’s life story and work, but also honor the biographies yet to be written. Let children on Roosevelt Island (thousands more of whom are being added with dense, large-scale development) walk out their doors and into a soul-fortifying relationship with nature. Great Egrets have found nearby Long Island City and Mill Rock Island, so why not invite them to Roosevelt Island? Roosevelt Island is full of paddlers and rowers eager to hit the water, and plans for a boathouse are afoot. A hardscape doesn’t fit the new desire for a landscape that invites residents and visitors alike into uplifting green and blue.